The Next Generation of Coral: What Can It Teach Us? This is the question being posed by three researchers—Samantha de Putron and Gretchen Goodbody-Gringley of BIOS, and Hollie Putnam of the University of Rhode Island—in a new investigation funded by Pembroke Foundation International, Ltd.
Coral reef ecosystems provide a wide variety of goods and services to people around the world. They are home to many species of commercially valuable fish and shellfish; they act as ecological reserves of genetic complexity and biodiversity which may prove useful for medical advances; they provide physical protection to shorelines and coasts; they fuel coastal tourism and offer the foundation for many reef-related recreation activities; and they contribute directly to the livelihoods of tens of millions of people. Globally, the ecosystem goods and services provided by coral reefs are valued at U.S. $36 billion each year. Coupled with increasing environmental threats, such as climate change and bleaching events, it is becoming increasingly important to understand how corals adapt and acclimatize to climate change and recover from climate-induced disturbances through coral reproduction. “Our research asks: will the current generation of corals be better able to cope with stress as they continue to experience it? And will the next generation of corals be adapted to the environmental conditions experienced by their parents?” said de Putron, a marine biologist and coral reef ecologist. An experimental setup inside a lab at BIOS, where Putnam, de Putron, and Goodbody-Gringley use enclosed aquaria to measure dissolved oxygen and determine the respiration rates, one of many measures of coral health and fitness, of colonies of mustard hill coral (Porites astreoides). Photo credit: Hollie Putnam/URI. The team of three researchers brings together expertise in molecular ecology, coral physiology, coral reproduction, epigenetics (the study of biological mechanisms that turn genes on and off), and in-situ fieldwork to conduct a three-year investigation of coral adaptation and resilience in Bermuda. Putnam, a coral biologist and molecular eco-physiologist, has examined how the environment of the previous generation impacts the survival and fitness of the next generation of corals in Pacific reefs and is now expanding her research to Bermuda. The proposed research, which has been funded by Pembroke Foundation International, Ltd., includes the establishment of a state-of-the-art mesocosm facility at BIOS. 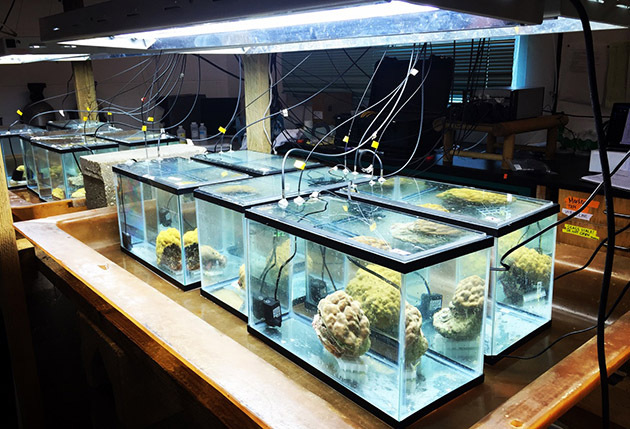 Mesocosm experiments are frequently used in coral reef research, as they allow for research to be conducted in outdoor experimental systems able to provide high-resolution control of environmental factors—in this case, seawater temperature, pH, and flow. 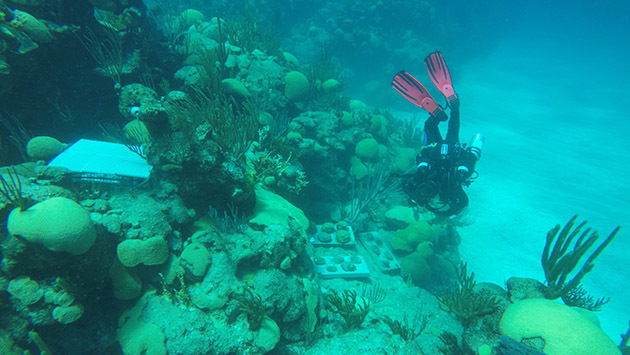 “The new mesocosm facility will enable finely tuned manipulative experiments allowing for comparisons of coral physiological and molecular responses to changing environmental conditions," said Goodbody-Gringley, a coral reef ecologist. 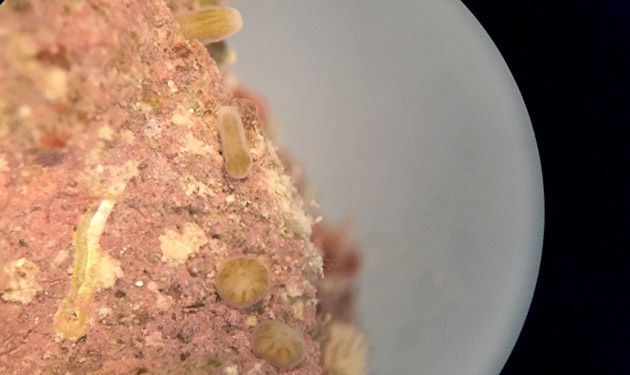 After being released from adult corals, Porites astroides larvae search for a place to settle on coralline algae. Elongated, pear-shaped larvae are swimming and searching, while circular compressed larvae have begun to metamorphose in order to settle, attach, and grow. Photo credit: Hollie Putnam/URI. Work on the project is set to begin in early 2018 and continue through 2020, with BIOS interns and Coral Reef Ecology students, as well as University of Rhode Island graduate students, taking part in the research. The three investigators plan to publish the results in open access journals, as well as present at international conferences such as the 2020 International Coral Reef Symposium, the annual Benthic Ecology Meeting, and the bi-annual Association of Marine Laboratories of the Caribbean conference.